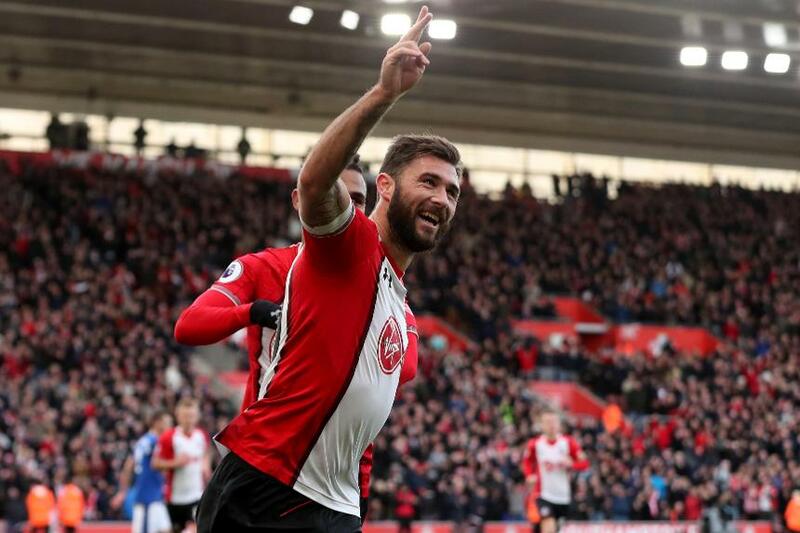 Handed a first start of the season, Charlie Austin's two goals and 13 points in the 4-1 win over Everton brought him to the attention of Fantasy Premier League managers. Along with Southampton team-mates Ryan Bertrand and Dusan Tadic, the striker is among eight players who earn their Dream Team debuts as the line-up shifts to a 5-4-1 formation. The stalemate with AFC Bournemouth brought only a second clean sheet in eight Gameweeks, helping Fabianski earn a second Dream Team call-up. The Pole has claimed 12 points for saves this season, totalling 51 stops - nine more than any other goalkeeper. 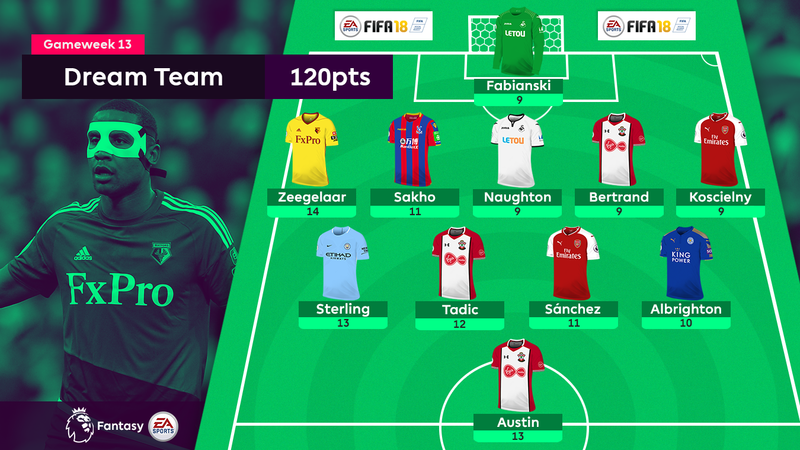 The Hornets defender makes his Dream Team bow in only his second start with the highest individual score of Gameweek 13. Playing at left wing-back, Zeegelaar produced two assists in the 3-0 win over Newcastle United and has created five chances over his two appearances. A stoppage-time winner against Stoke City was Sakho’s first goal for the Eagles. Along with a pass completion rate of 93%, it helped the Frenchman claim maximum bonus points, despite conceding in the 2-1 victory. The right-back made eight recoveries and seven clearances, blocks and interceptions (CBI) in Swansea City's clean sheet against AFC Bournemouth, claiming the maximum three bonus points and nine overall. A first Dream Team appearance arrives courtesy of his pair of assists in the Saints' 4-1 victory over Everton. They were Bertrand's first attacking returns of the season, having supplied two goals and five assists in 2016/17. A standout performance in the 1-0 win at Burnley produced 10 CBI and two key passes, ensuring the Frenchman maximum bonus points. Arsenal have six clean sheets over the last 10 Gameweeks ahead of a home meeting with Huddersfield Town, who are without a goal in their last five away matches. An eighth goal of the season - along with an assist and three bonus points - helped claim a third Dream Team berth. Sterling is now averaging 7.1 points per match. Only Paul Pogba (£8.0m and 7.7) and Mohamed Salah (£9.7m and 7.3) can better that among midfielders. A former FPL favourite from previous seasons, his 10 points in the 1-1 draw with West Ham United were enough to secure a first Dream Team appearance of this campaign. The Serb produced his first double-figure haul, just as Southampton's fixtures turn against them. With five of their next eight matches scoring four or more in the Fixture Difficulty Rankings (FDR), the 1.9%-owned midfielder is likely to remain a differential. Three goals and three assists from his last seven outings suggest that Sanchez is edging back to the form that made him the top-scoring player in 2016/17. Since Gameweek 6, only Harry Kane (£12.8m and 40) has fired more shots than Sanchez's tally of 31. Like Tadic, the striker has timed his ascent as an FPL option ahead of some testing fixtures. However his two goals and five shots inside the penalty area - joint-top in Gameweek 13 - hint that Austin could still yet become a viable cut-price option.